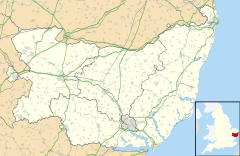 Hart's Green is a hamlet in the civil parish of Lawshall in the Babergh district in the county of Suffolk, England. It is located between Stanningfield and Hanningfield Green and is just over a mile off the A134 between Bury St Edmunds and Sudbury. The road that serves Hart's Green is known as Donkey Lane. Donkey Lane was known as Bury Way/Street (and also Netherhall Street) in the 1567 Lawshall Survey. On the east side of Donkey Lane, south of Makin Farm, there is a farm track which was known as The Drift Lane. On the west side of Donkey Lane there was a track known as The Kitchen Lane that led from Carpenters Cottage (previously a public house) to Lawshall Hall. NB: The above property details usually represent the names and addresses that were used at the time that the buildings were listed. In some instances the name of the building may have changed over the intervening years. ^ Lawshall Parish Council, ed. (2006). Lawshall: A Guide to Your Village. Lawshall Parish Council. p. 16. ^ a b c Lawshall Village Appraisal Group, ed. (1991). Lawshall: Past, Present and Future – An Appraisal. Appraisal Group. ^ "The Suffolk Real Ale Guide - Lawshall: Carpenters Arms". Suffolk CAMRA. Retrieved 2012-02-07. ^ "London & Southern England Pub History site - Carpenters Arms, Lawshall, Bury St Edmunds". London & Southern England Pub History website. Archived from the original on 6 July 2008. Retrieved 7 February 2012. Wikimedia Commons has media related to Hart's Green. This page was last edited on 3 March 2018, at 12:45 (UTC).